abc7NY Holiday Giveaway: Win a $1,000 Apple gift card! 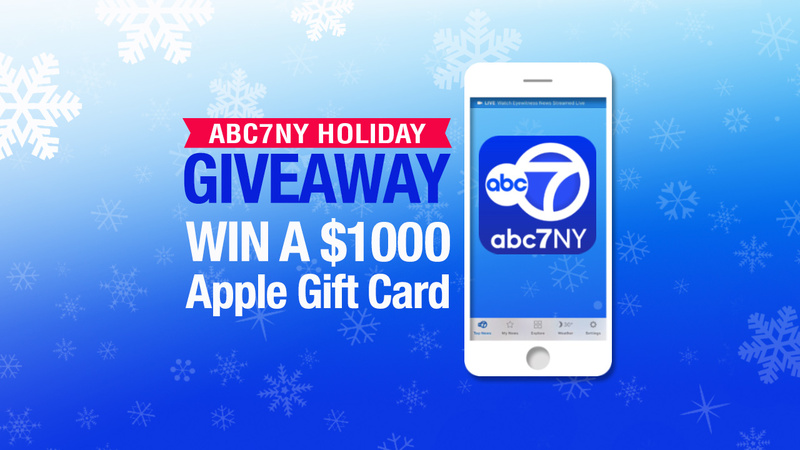 NEW YORK -- It's the abc7NY Holiday Giveaway - your chance at winning a $1,000 Apple gift card! Download or update the new abc7NY app from Eyewitness News, and you could win big! Just open the app, scroll through the Top News section, and tap the 'Click to Win' button. You can enter to win each day from December 28 until January 1. We'll pick one winner each day. Look for the update here in the Apple App Store for iPhone, or go here for the Google Play Store. It's our holiday gift to you! So download or update the abc7NY app today! We've brought some exciting updates to our abc7NY app: More chances to customize it, personal push alerts and and improved live video streaming experience. The app's easy to use, always up-to-date and a quick and easy way to share articles on Twitter, Facebook and email. Find out all about how to personalize your app here! Apple is not a participant in or sponsor of this promotion. No purchase necessary. Must be a legal resident of NY, NJ or CT and 18-years or older to enter. Void where prohibited. Apple Store Gift Cards can be redeemed on the Apple Online Store and at Apple Retail stores only, but not on the iTunes Music Store or the App Store.